Cat grooming goes beyond the coat - cleaning your cat's ears, eyes, nose, and teeth is an equally important part of your cat's hygiene. In Part One, we looked at coat care for cats, which is arguably half the battle of keeping your cat clean and healthy. However, cat grooming doesn't stop at the tip of Kitty's tail; there are plenty of other parts of your cat's body that need attention! The ears can be cleaned used an approved cat ear cleaner and cotton balls to gently clean the outer ear of wax and dirt. Do not use cotton swabs or try to clean out the inner portion of your cat’s ear. Only clean what you can see. Distract your cat with a kitty treat or toy while you make gentle swipes to clean the ears. Tear stains can cause unsightly marks on your cat’s fur. Use distilled water or an approved cat eye cleaner on a cotton ball. A pair of sharp scissors clip away hair that lies too near the eyes for comfort. Be very careful. Whenever possible, use blunt-ended scissors, like the Tiny Trim, to avoid inadvertent gouges. It might be helpful to have an assistant to distract your cat or hold them still. Your cat’s nose can be wiped clean with water and a cotton ball or cloth. For cats that have a lot of wrinkling around the muzzle, like Persians, you will want to clean out the folds with a damp cotton ball or swab. Regular attention to this area can prevent infection of the skin. Some cats have been trained to allow their owners to brush their teeth. This usually starts in kittenhood and is a good way to keep your cat’s teeth in trim. Find a kitty toothpaste your cat really likes. Allow your cat to lick a little every time you have a teeth cleaning lesson. Begin gently. Stroke around your cat’s mouth to start. Gradually introduce a finger and rub around your cat’s gums. Use the toothpaste to reward the cat. Never associate teeth cleaning with punishment in any way. If your cat is not open to the idea of tooth brushing, you can help keep their mouth clean with products for their drinking water, special food and toys that encourage good dental hygiene. Try to check as much as your cat will let you for anything out of the ordinary. Cats should have scratching posts that encourage them to scratch appropriately. However, that might not be enough to keep your cat’s nails down to a reasonable length. Nail clipping is the solution to too-long nails and too-sharp ones as well. Nail clipping is actually pretty easy if you have a cat that will stay still for it. Simply take a paw and gently press down on one toe to extend the nail. Most cats have white nails, so you can see the quick. In any case, you just want to nip off that sharp end of the cat’s nail. Sweeten the deal with a kitty treat after every toe. 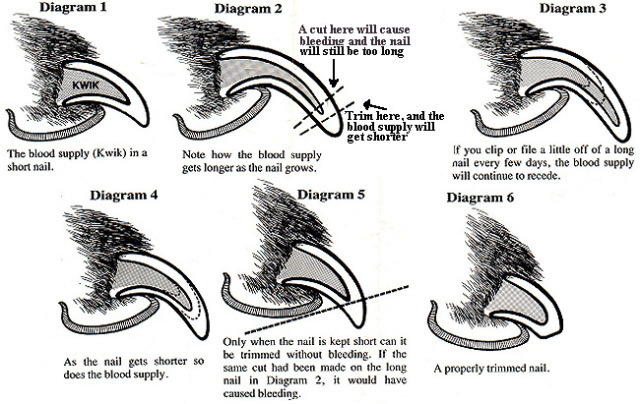 If your cat is fussy about having their paws touched or toes manipulated, start slow without the nail clipper. You can also do one toe at a time or as many as your cat will tolerate. While clipping your cat’s nails, check pads for injuries or anything sticking to the toes that could cause discomfort. Say goodbye to those dreaded "litterbox ornaments". The body of your dog or cat can be easy to maintain on top, but more difficult around the belly and groin areas. Read our tips for grooming the body.